Believe it or not, you read that right. 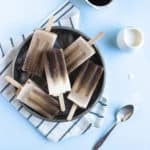 MOSTLY healthy cake batter frozen yogurt popsicles!! Copious amounts of sprinkles… Flashy graphics… Yeah, that’s more like it. I mean, at this point I imagine you’re either hungry or having a seizure. Either way, sorry? 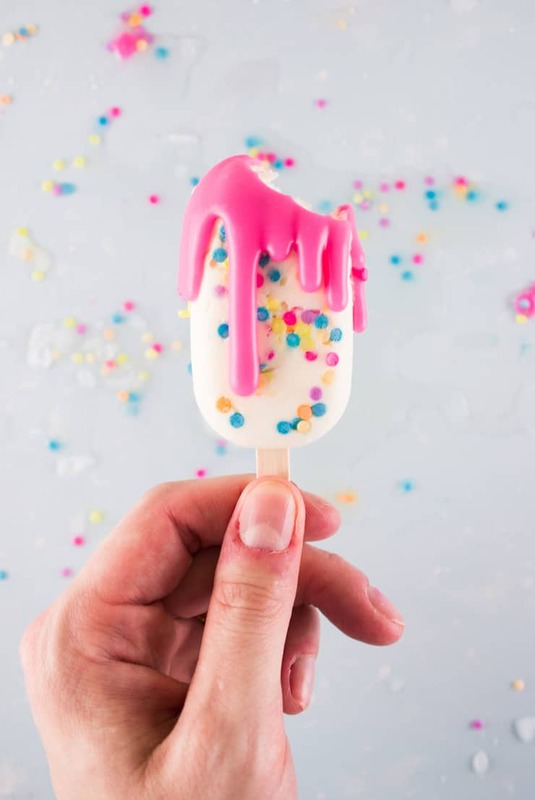 Hopefully you’re just hungry and itching to get your hot little hands on the aforementioned mostly healthy cake batter popsicles because THAT I can help you with. And holy moly are your taste buds AND waistline going to be happy with you (<— Savor that latter part because that is NOT something we can say everyday around these parts). Seriously, we’re talking 125 calories a pop here folks. Also, the afternoon sugar coma crash was starting to feel counter productive. There just HAD to be a way to be healthy AND get my early morning cake fix (because, priorities people). 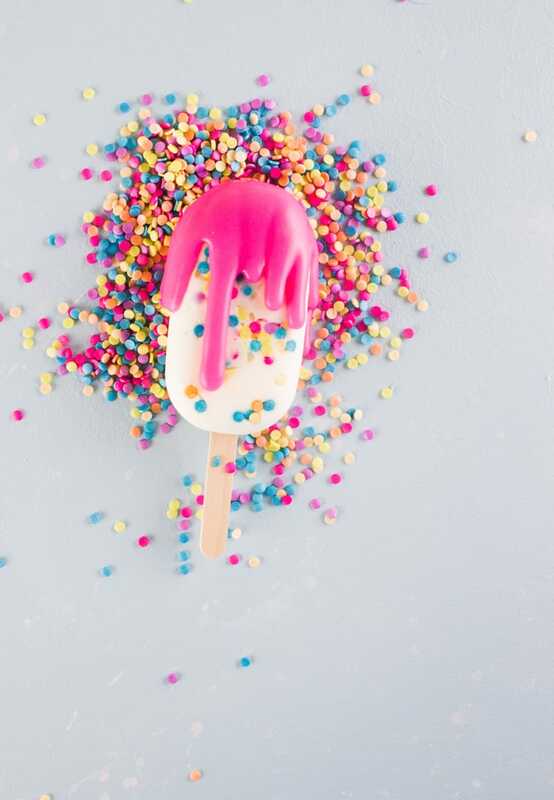 Enter the mostly health cake batter popsicle. If you didn’t imagine that with angelic light and a chorus of angels in the background, you’re doing it wrong. These low calorie, low fat cake batter yogurt popsicles are so good, you won’t believe they’re almost healthy. In a small bowl, whip the whipping cream until stiff peaks form. Add the low fat vanilla yogurt and butter emulsion, stirring until thoroughly mix. 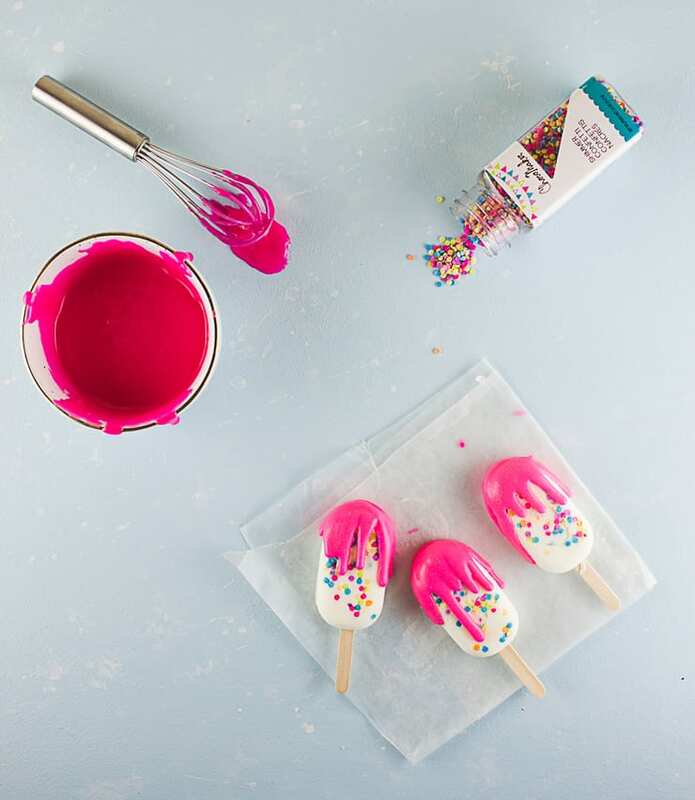 Shake a few sprinkles into each of the molds and cover with the yogurt mixture (adding the sprinkles to the whole mixture may cause the colors from the sprinkles to run, depending on the kind of sprinkles you’re using). Put the molds into the freeze and allow to set overnight, or for at least 5-6 hours. 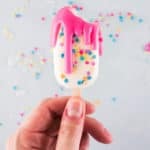 Remove the popsicles from the molds, drizzle with a teaspoon or two of melted pink candy melts, and garnish with more sprinkles. These are SO fun!! Love how bright and colorful they are! I love these too… along with your great sense of humor 🙂 You crack me up! But these do look delicious…. 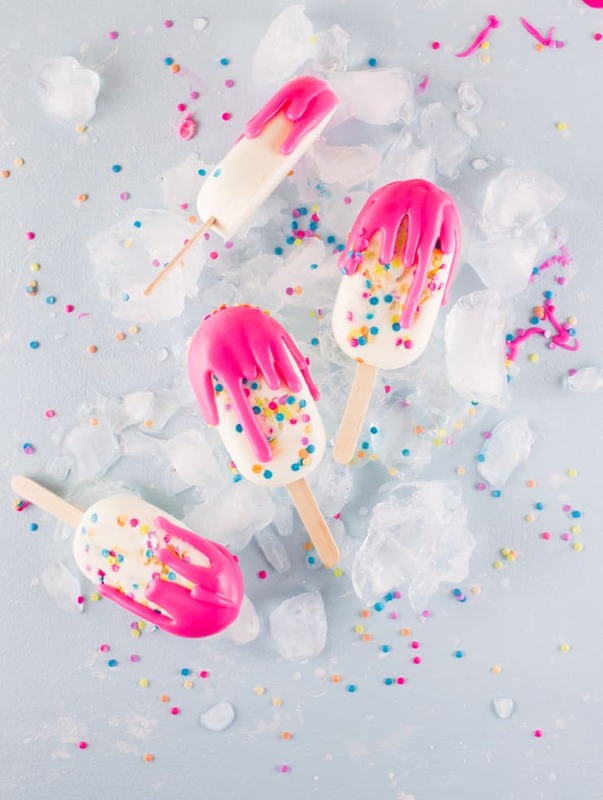 I just love these so beautiful popsicles!!! Great colorful presentation. Thanks for sharing!!!!! 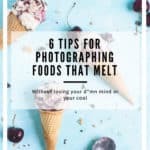 The picture caught my eye, the recipe caught my tastebuds, waistline, and bathroom scale! I love the humor you put into it! These look SO fun! 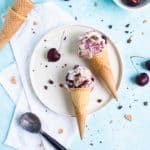 Can’t wait for the weather around these parts to warm up so we can indulge in these this summer! 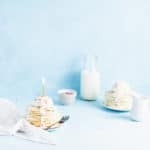 Cake batter for breakfast? I am SO there. Also, these are so stinking adorable and fun- how can a gal resist! ?